First Avenue: Who are you? FA: And you do what? DL: I manage merchandise for touring. Predominantly I work for Atmosphere and other stuff trickles in. Fifth Element is where I first got to know these people. I interned there between design jobs. I have a work ethic that doesn’t quit, so… the big 20-foot graffiti wall they can change out, I designed the cleat system for that, things I wasn’t really supposed to be doing. After that I just stayed in contact by helping where I could. FA: You made yourself useful over and over. DL: Yeah, that’s exactly what my mentality has been: make yourself indispensable because there’s probably a thousand people clamoring for my position at all times anyway, and would probably do it for cheaper, but I know they wouldn’t do it better. #humblebrag I didn’t know I’d like it as much as I do after they asked me to do it the first time at First Ave. 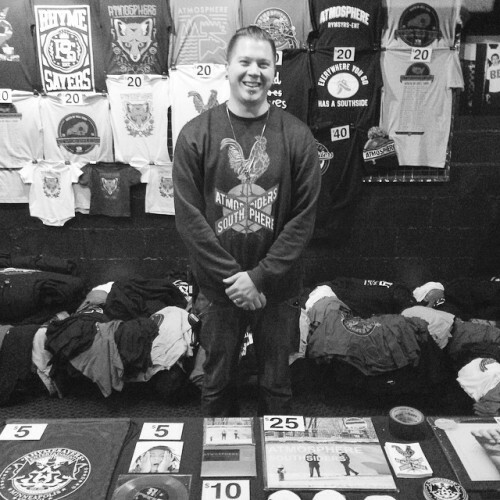 It was the back-to-back Thanksgiving show, which I believe was in 2010, and they were like, “Hey, we need somebody to do merch!” I’d actually bought tickets to go to the show the next day but I enjoyed it so much that I sold them back to the shop and was like “Hey, I wanna do merch again if that’s cool with y’all.” Something about it grabbed me right away, I guess. FA: What do you think it was? DL: I get a good vibe out of seeing people enjoy themselves so much. I’m really meticulous, always have been, so it’s a challenge to see if I can have a perfectly balanced day, make sure no one steals anything, make sure my display looks nice. My math background, my design background, and my enjoyment of t-shirts all mixed together. When not fondling t-shirts, Doug enjoys cooking, collecting shoes, and all things Lego. Say hi; he’s a gem.